With eleven key players taken from the teams that took to the field at AAMI Park on Thursday night, one might have been excused for ducking out to the local Chinese and missing the footy. The potential to be underwhelmed must have surely crossed the minds of the average fan and perhaps even the supporters of the two combatants, who both would have a rock-solid excuse if beaten. Thank goodness the coaches and players did everything in their power to lure us away from the sweet and sour pork and lemon chicken. They provided every possible reason to stay in and persist with the game rather than heading out for a bite. 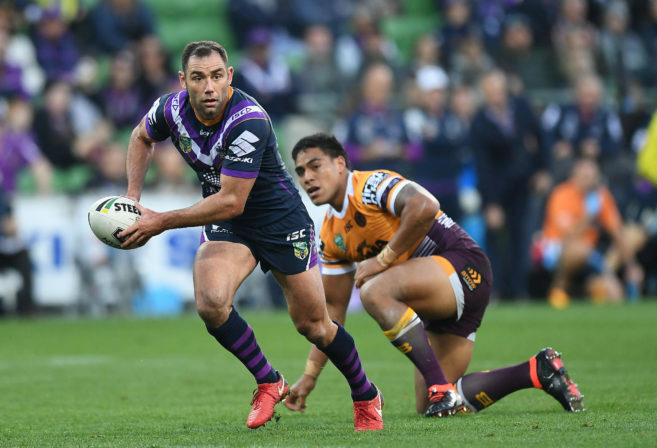 The reality is that without its entire back row, halfback and front rower Paul Vaughan, the Dragons’ fans would have been well within their rights to write off a clash with the Storm during the origin period. However, the champions from south of the border managed to throw up six Origin players of their own and if not for the shock representative retirement of Cameron Smith, the Red V may have felt even more confident entering the game. The curse that Melbourne has on the Dragons would surely not apply with two teams so affected by representative duty? As it turned out, there was little between the teams and the Dragons ground their way to a competitive first half position, based on outstanding completions and the determined and resilient attitude that its young team took into the game. Early tries to Curtis Scott and Brodie Croft were cancelled out by four pointers to Kurt Mann and Nene MacDonald, before Cheyse Blair scored in the thirty-third minute to seemingly take the initiative in Melbourne’s direction. Within moments Euan Aitken crossed the line and the subsequent conversion saw the Dragons in front for the first time. With seconds remaining in the first half, Hoffman broke clear down the left and the Storm took a 22-18 lead into the break. The Dragons pressed early in the second half off the back of continued completions and tries to Mann and Luciano Leilua which pulled them level after Young Tonumaipea had scored for Melbourne. From there on the exhibition lived up to its name with the Storm piling on four tries in the final 14 minutes to turn a tight scoreboard and contest into a rather lopsided affair. Anyone who missed the game might well have interpreted the final scoreline as something of an embarrassment for the Dragons yet it was far from the case. James Graham was tireless in the middle, Matthew Dufty and Leeson Ah Mau gave everything, yet once again, the Storms’ ability to find fringe players to fill the roles absented by rep players won the day. Jahrome Hughes and Brodie Croft should be on the radar of clubs looking for quality in the spine and the forwards that Craig Bellamy has waiting in the wings would be assets in most teams. Sadly it meant little, considering how far removed the starting teams were from the ones likely to meet in semi-final play, yet entertaining it was. Friday night saw the Panthers at home to the Warriors, in a game where the top eight contending New Zealanders would historically fumble their way to a loss and confirm suspicions of their fragilities. If anyone was hoping for that type of result they weren’t disappointed, as the youthful Panthers put on six unanswered tries before the visitors finally crossed the line in the 76th minute. It was a convincing 36-4 trouncing in which the home fans saw the best of the young wave of talent from the foot of the mountains. That talent is destined to decide the hopes and successes of the Panthers over the next decade and its promise is unquestionable. 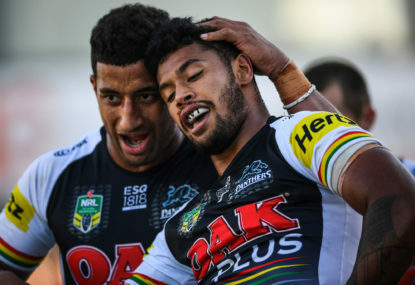 The Warriors now slip to seventh in a heavily congested top eight and the Panthers continue to make a convincing argument for their inclusion in Premiership discussion. Without their State of Origin halves they have avoided major damage through the representative period and sit within two points of the ladder leading Rabbitohs. The Warriors appear a long way from the side that took the premiership by storm in the early rounds. With such a gap between the top eight and the also-rans, their finals spot is probably safe. However, competing in and being a serious threat in the playoffs are two different things and right now, the Warriors look to be making up the numbers.